Free to download. 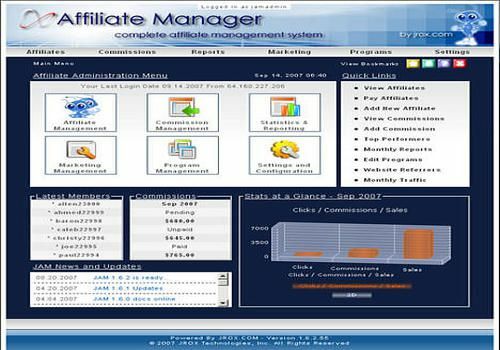 JROX.COM Affiliate Manager is a powerful, dynamic affiliate management system that is fully customizable. Easy Web-Based Installation with auto-uploader, you can have your own affiliate marketing system installed in a matter of minutes. Support for multiple marketing tools, such as banner ads, text ads, text links, email marketing ads, and hover ads. Built-in Graphical View of Affiliate Downlines available.